Brompton are a British manufacturer who make one of the world's most iconic folding bicycles. Originally designed in 1977, it has been continuously refined ever since. They have now brought out this new toolkitthat fits discretely within the front frame tube such that, when the bike is in use, the toolkit is fully enclosed within the frame. The kit includes all the tools necessary for most road-side repairs in a compact, lightweight unit. 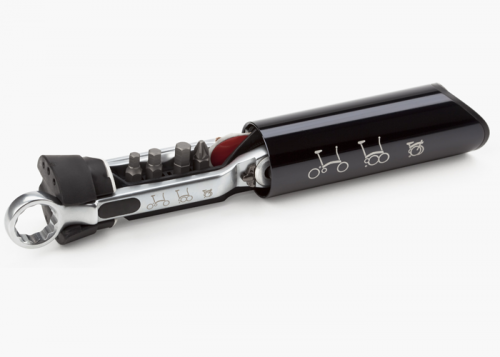 Perhaps the most innovative features of the kit are the space-saving double-ended driver bits and the unique tyre levers. These make removing tyres substantially easier and also incorporate 10 and 12mm spanners (patent-pending).